"""Any traveler can appreciate the convenience provided by this curated set of travel solutions which includes our Ultralight Garment Folder to keep your nice shirts looking sharp, as well as a Large and Medium Packing cube for your rolled t's, socks, or unmentionables. Our philosophy for travel is simple: Make it easier to organize and pack your gear when travelling so that you can spend more time enjoying your experience. No matter your packing style or destination, our comprehensive line of curated travel solutions has something for everyone. 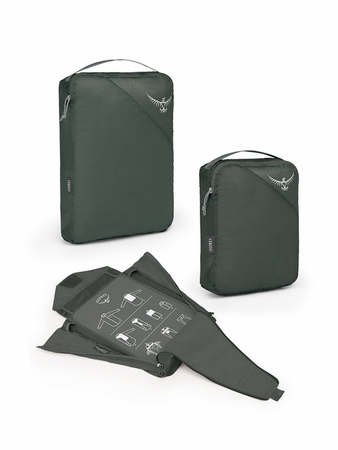 Traveling to Russia for business The Garment Folder will keep your shirts fresh and clean. More of a shirt roller No problem, packing cubes are your answer (also for undies and such). Do your workout clothes smell like a yeti Boom, Double Sided Packing Cubes. Need something to carry to the beach when you arrive Stuff Tote is your jam. Whatever your activity, destination, or style, we have your needs covered in spades. UL Travel Set includes the following: Garment Folder, Packing Cube (L), Packing Cube (M) "